The task faced by the world’s new tank arms at the end of World War I was firstly to survive, and secondly to secure emancipation from their positions subordinate to one of the armies’ other arms. It was to be a difficult task occupying the 1920s and most of the 1930s. To the politicians the tank could embody the concept of ‘an engine of war’ and thus smacked too strongly of militarism; to the economists the tank represented a high level of development cost, followed by high production and operating costs; and to the professional heads of the world’s most significant armies the tank was an unessential embarrassment. Among the soldiers the more far-sighted were content to see the retention of the tank in small numbers as an adjunct of the infantry (medium tank) and of the cavalry (light tank), while as noted above the majority wished to return to the pre-1914 pattern in which they had trained and gained most experience of practical soldiering. As a young arm, the tank service of most countries had attracted relatively junior officers with an interest in the mechanisation that was becoming important in the period up to World War I but without ‘entrenched’ attitudes to military operations: these men were able and eloquent, but had generally risen only into the lower levels of field rank, and were therefore able to achieve little but keep up a constant but carefully controlled stream of propaganda to keep their arm alive pending the day it could prove itself. In the type of perverse reversal for which they are famous, the British squandered the technical and tactical lead they had established in World War I by a programme of parsimony so extreme that it could well have led to extinction. Yet the British tank arm was saved by the twin efforts of men working solely within the professional confines of the army (middle-ranking officers such as P. Hobart, C. Q. Martel and Ernest Swinton) and a smaller number of men such as Colonel J. F. C. Fuller and Captain B. H. Liddell Hart working mainly on the outside of the army framework to develop and bring to wider attention their theories of armoured warfare. Within the army, the middle-ranking advocates of armoured warfare worked to convince their largely sceptical superiors that the era of fully mechanised warfare had arrived, and that the cornerstone of the new type of warfare was therefore the tank: the army protagonists urged as strongly as they could the concept of the tank as embodying the primary virtues of firepower, protection and mobility in a package of unrivalled versatility; and at the same time they urged that the army open its mind to the possibility of merging the new weapon with a new set of tactical doctrines whose absence would negate all the advantages of a tank force. This tied in neatly with the role played by Fuller and Liddell Hart, who were concerned not just with the practicalities of armoured warfare with the weapons to hand and under development, but with the ‘ideal’ of armoured warfare and therefore the course in which the long-term development of tanks should be directed. At the core of the thinking of both Fuller and Liddell Hart was the concept that the tank was a new weapon, perhaps presaged in other weapons, but in its post-World War I form a weapon different from those of the infantry, cavalry and artillery, and as such requiring the formulation of a new set of tactical precepts. Fuller was the tactical thinker par excellence, and his ideas stemmed directly from the British experience in the Battles of Cambrai in 1917 and Amiens in 1918: if it made full use of its mobility the tank was unstoppable, giving its operating country the ability to strike at will against different points in the enemy’s line; this would force the enemy onto the defensive and dilute his strength to the point that he would find it impossible to counter the tank attack and consequent breakthrough at the offensive’s chosen point; the threat thus posed to the enemy’s lines of communication would in turn force the enemy to retreat, the accumulation of such retreats leading inevitably to the enemy’s defeat. Fuller was the great advocate of the ‘all-tank’ school of thinking, which averred that the evolution of the tank had rendered obsolete all other combat arms: cavalry had been rendered manifestly obsolete by the advent of mechanization, infantry was required merely to garrison that which the tanks captured, and artillery should be replaced by special versions of tanks fitted with large-calibre ordnances (self-propelled artillery) yet able to match the tank force for speed and mobility. In this latter concept Fuller went too far, and in the process so threatened (or appeared to threaten) the established arms that they banded together to stem the further acceptance of Fuller’s notions. In the long run, therefore, Fuller had a partially counterproductive effect on the development of the British tank arm when he moved out of the province of tactics into the more difficult intellectual and moral terrain of operational doctrine. Working from the same basis of operational experience as Fuller, Liddell Hart moved more easily from the field of tactics to the terrain of operations and strategy based on exploitation of the tank’s speed (mobility) combined with its shock effect (firepower and protection). The key to Liddell Hart’s concept was tactical and operational surprise: thus the initial offensive could be a hammer blow by massed armour into and through the enemy’s front line, followed by an unrelenting exploitation in which the key was outright speed to keep the enemy off balance. Tanks must therefore be organised to push straight through opposition or, if the latter was too strong, bypass and isolate it for elimination by the follow-up forces. By maintaining its impetus, Liddell Hart showed, the tank force could punch through to the enemy’s rear areas on a narrow front and then fan out in an ‘expanding torrent’ that would prevent the enemy’s reserves from moving up in effective support, and then by destroying, capturing or incapacitating his command and logistic centres crush the enemy’s capability to sustain the defence. It is worth noting here that Liddell Hart saw the full potential of the aeroplane for a battlefield role: Fuller had rightly realised the value of the aeroplane for reconnaissance and communication, but Liddell Hart had gone farther in recognising the fact that the aeroplane was the ideal substitute for artillery in his ‘expanding torrent’, possessing yet greater mobility than the tanks they were to support and having the three-dimensional agility to negate the effect of the enemy’s anti-aircraft artillery while delivering attacks of pinpoint accuracy. Liddell Hart’s concept was remarkably far-sighted, but was little accepted in his own country as anything but an idealised picture of future warfare. It was a failing with immense consequences. The overall failure of the army advocates, Fuller and Liddell Hart should not be construed, however, as failing in smaller objectives. The most important successes gained by the tank advocates were in the development of new vehicles possessing far greater mobility than their World War I predecessors in terms of agility, speed and range. The development programme was severely limited by lack of funds, but evolved via two main streams, namely the one- or two-man tankettes from the Morris-Martel and Crossley-Martel stables, and the two- or three-man light tanks from the Carden-Loyd and Vickers stables. The tankette concept can most readily be traced back to 1915, when Colonel J. E. Estienne of the French army had proposed that conventional infantry could be replaced by large numbers of skirmishers mounted in small cross-country vehicles carrying sufficient armour to defeat small arms fire. This concept finally resulted in development of the excellent Renault FT, to which the British had no equivalent. After World War I, however, Fuller became an enthusiastic proponent of the idea of a skirmishing and reconnaissance tank. Fuller soon secured a significant following within the Tank Corps (from 1923 the Royal Tank Corps), including Major Gifford Martel. For lack of official interest or funds, Martel undertook the design and construction of a prototype at his own expense during 1925, using commercial components from a number of sources, tracks provided by the Roadless Traction Company, and a wooden body. Trials of the Martel One-man Tankette were modestly successful, and persuaded the army to order four pre-production versions from Morris Commercial Motors. Three of these were Morris-Martel One-Man Tankettes, and the fourth the sole Morris-Martel Two-Man Tankette. Like the Martel original, these used commercial components including the 16-hp (11.9-kW) Morris car engine to drive the short tracks in front of the twin steering wheels at the rear; the maximum speed was 20 mph (32 km/h). At 9 ft 1 in (2.77 m), the one-man version was the same length as the Martel prototype, but was fitted with light armour and a single machine-gun for a weight of 4,925 lb (2234 kg) rather than 4,500 lb (2041 kg). Another one-man machine was developed by Crossley as the Crossley-Martel One-Man Tankette, but both one-man designs proved impractical: the operator could not drive and operate the machine gun effectively, so greater emphasis was placed on the more versatile two-man version, of which eight examples were ordered in 1927 as scouting machines with the Experimental Mechanized Force then being created to evaluate the tactical and conceptual notions being produced by British tank enthusiasts. The Morris and Crossley variants of the Martel theme paved the way, but were in themselves unsuitable for anything but the most limited experimental and development work. 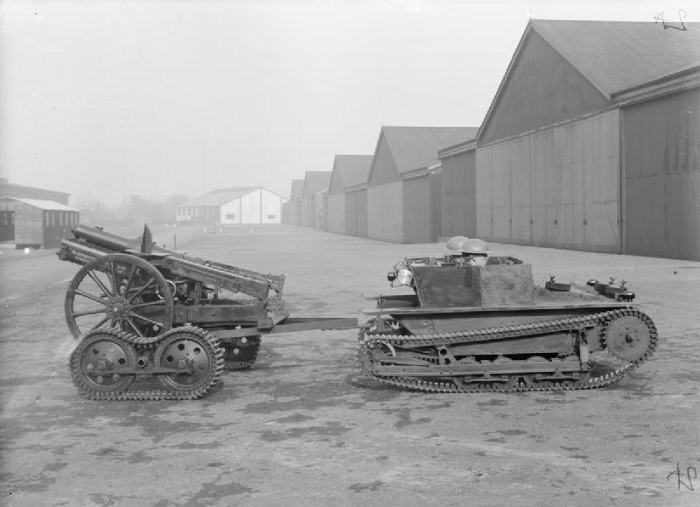 Greater success attended the efforts of Carden-Loyd Tractors Ltd, who in 1925 produced the Carden-Loyd One-Man Tankette prototype and then capitalised on the interest in the Martel prototypes to approach the War Office. A single official prototype followed, this having a box body that left the operator’s shoulders and head exposed, but offered performance advantages over the Martel types in having longer tracks without separate steering wheels plus, on each side, 14 coil-sprung road wheels instead of the Morris’s two and Crossley’s four road wheels. The prototype was followed by Carden-Loyd Mk I, Mk I*, Mk II and Mk III versions with a number of developments and refinements, but these single-man machines suffered the same tactical limitations as the Morris and Crossley one-man tankettes. In 1926 the company had produced the Carden-Loyd Two-Man Tankette prototype, with a wider a lower hull to accommodate the second man. The revised hull added to tactical capabilities and also improved the stability of the basic design. Development then produced the Carden-Loyd Mk IV with a number of mechanical improvements and provision for a single 0.5-in (12.7-mm) Vickers machine-gun. Next in numerical sequence appeared the Carden-Loyd Mk V, a tricycle wheel/track machine of which eight were ordered to support the eight Morris-Martel Two-Man Tankettes, so next in the main stream of the company’s tankette developments was the Carden-Loyd Mk VI, built by Vickers-Armstrongs Ltd after its purchase of Carden-Loyd in 1928. The Mk VI was designed as a machine-gun carrier for one 0.303- or 0.5-in (7.7- or 12.7-mm) Vickers machine-gun, which could be fired from the vehicle or dismounted for installation on the tripod that was accommodated on the carrier. Just under 400 Mk VI vehicles were built for the British army and for export, but with this variant tankette design veers away from the mainstream of tank development towards the ‘weapon platform’ concept that led to the British Bren and Universal Carriers of the 1930s and World War II. The Mk VI was in its way an important and highly influential machine, serving to confirm the practicality of tracked vehicles for cross-country mobility and inspiring comparable developments in Czechoslovakia (the MU4), France (the UE), Italy (the CV33 and CV35), Poland (the TK3) and the USSR (the T27). The development of the Carden-Loyd Mk VI was the first result of the Royal Tank Corps’ 1927 decision that while the turretless tankette might have an application as a weapons-carrier for the infantry, the exigencies of armoured warfare called for turreted armament so that the crew was at all times protected. The Royal Tank Corps therefore replaced the tankette with the light tank as the reconnaissance element of its tactical thinking. The first of the breed had been the 1925 Royal Ordnance Factory Light Tank A3E1, an experimental machine designed to test the feasibility of using a commercial engine and cast steel track shoes to reduce manufacturing costs, and carrying fore and aft machine-gun turrets. The first practical light tank design was therefore the Carden-Loyd Mk VII, a two-man vehicle that appeared in 1929 for evaluation as the A4E1. Though evolved from the earlier Carden-Loyd vehicles, the Mk VII provided striking proof of the pace of armoured vehicle development in the later 1920s, for it was a machine markedly superior to its predecessors in all respects. The armament was still a single 0.303-in (7.7-mm) Vickers machine-gun, but this was located in an exceptionally trim turret with bevelled edges on its top to reduce its silhouette. More notable, perhaps, was the increase in performance generated by the new running gear and more powerful engine. The former comprised four large road wheels in leaf-sprung pairs connected by an external girder, and the latter a 59-hp (44-kW) Meadows petrol engine: the result was a maximum speed of 35 mph (56 km/h) for this 5,600-lb (2540-kg) vehicle. Trials confirmed the overall suitability of the A4E1, which was developed for small-scale production as the Carden-Loyd/Vickers Light Tank Mk VIII and accepted as the British army’s first light tank in 1930 under the designation Light Tank Mk I. The running gear was revised and the engine was a 58-hp (43-kW) Meadows EPT petrol unit providing a maximum speed of 30 mph (48.3 km/h) in a vehicle that weighed 10,750 lb (4876 kg) and possessed armour varying in thickness from 4 to 14 mm (0.16 to 0.55 in). The Light Tank Mk I was then developed in variants designated between A4E2 and A4E5 for use in running trials and experiments, paving the way for the Light Tank Mk IA. This first appeared in October 1930, and was generally similar to the Mk I apart from its better-sloped armour. Again the type was produced in various forms with designations varying from A4E6 to A4E10 to evaluate features such as Horstmann coil-spring suspension, laminated-spring suspension with shorter tracks and no idler wheels, different armament fits (including a tall turret with two machine-guns in superimposed mountings) and a different engine. Further development of the Mk IA produced the Light Tank Mk II, of which 16 were built in 1931. The type had the hull of the Mk IA, Horstmann suspension and a 66-hp (49.2-kW) Rolls-Royce petrol engine for a maximum speed of 30 mph (48.3 km/h) at a weight of 9,500 lb (4309 kg). The type was produced in A4E13 to A4E15 variants, and important trials were undertaken into the amphibious employment of such vehicles. Mechanical and tactical development was rampant during the early 1930s as the British army came fully to grips with the concept of total mechanization, and the Mk II was rapidly joined by the Light Tank Mk IIA (29 A4E16 and A4E18 vehicles built by the Royal Ordnance Factory, Woolwich) and the Light Tank Mk IIB (21 A4E17 vehicles built by Vickers-Armstrongs Ltd). The two variants were essentially similar, and were in essence an upgraded Mk I with the Horstmann suspension of the Mk II though with two rather than three track-return rollers. There was also a Light Tank Mk IIB (India Pattern) with the Meadows EPT engine and a non-rotating cupola atop the turret. In production terms, the family evolved directly from the Carden-Loyd Mk VII ended with the Light Tank Mk III and Light Tank Mk IV. The Mk III entered service in 1933 as a Mk II with its superstructure lengthened to the rear. The ultimate developments from this were the Light Tank Vickers Experimental Model 1933 India Pattern No. 1 (A4E19) and No. 2 (A4E20), with features such as a shorter and wider hull, lighter armour and a 90-hp (67.1-kW) Meadows EST engine to reduce weight, facilitate production and increase speed. The Mk IV series was produced in 1934 on the basis of the two Model 1933 experimental variants. In the Mk IV the hull was made of armour varying in thickness from 5 to 12 mm (0.2 to 0.47 in) and, for the first time in British practice, used as a monocoque chassis with components attached directly to it. And an important feature adopted from the Model 1933 variants was the omission of the rear idler wheels: this track layout combined with Horstmann suspension and an 88-hp (65.6-kW) Meadows ESTE engine provided the 10,300-lb (4672-kg) Mk IV with a maximum speed of 36 mph (57.9 km/h).